Russia-backed militants increased the number and intensity of armed provocations along the entire frontline yesterday afternoon. In total, Russian proxies conducted 17 attacks at Ukrainian Armed Forces’ positions. 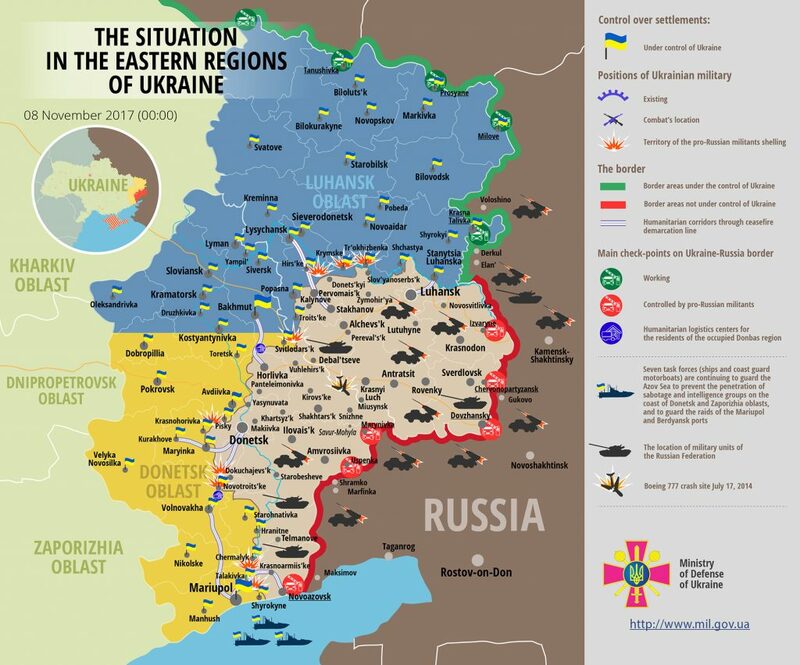 “Two Ukrainian troops were killed in action near Krymske, one was wounded and two more sustained combat injuries. The casualties were promptly evacuated to medical institutions, their injuries are not life-threatening,” reported Ukrainian Ministry of Defense spokesman on ATO Colonel Andriy Lysenko at a press briefing at Ukraine Crisis Media Center. In Luhansk sector, militants opened aimed fire at ATO troops’ positions eight times. “It happened the most frequently on the approaches to Krymske where the enemy conducted five attacks. They also used 120-mm and 82-mm mortars, firing a total of 19 rounds at our positions,” elaborated the spokesman. Militants were attacking Ukrainian position with 82-mm mortars, automatic grenade launchers and small arms in Triokhizbenka, Luhanske, and Novotoshkivske areas. “Ukrainian troops used grenade launchers and small arms three times to respond to the boldest provocations,” added Col. Lysenko. “In Mariupol sector, the militants conducted nine aimed attacks at Ukrainian positions. Ukrainian troops returned fire each time using all weapons not banned under Minsk agreements,” said the spokesman. After 16:00, Russian proxies attacked Ukrainian positions near Hnutove with 82-mm mortars, IFV weapons, and small arms. Moreover, militants attacked Ukrainian strongholds near Mykolaivka, Vodiane, and Berezove, using infantry fighting vehicles. Russia-backed groups attacked Ukrainian positions in the vicinities of Nevelske, Pavlopil, Novotroitske, and Shakhta Butovka with grenade launchers and small arms. Report on the military developments as of November 7 is available here. Interactive data on the shelling: chronology shelling chart and the interactive map.